Spring means different things to different people—but to baseball fans, it means just one thing: the start of another thrilling season. All 30 Major League Baseball teams begin play this month, delighting fans from Toronto to Texas and everywhere in between. The boys of spring carry on an age-old tradition—yet baseball is also changing with the times. 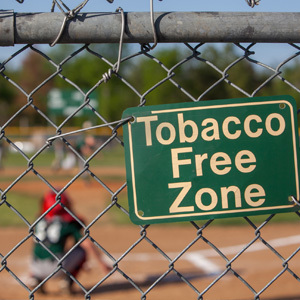 Cigarette smoking has been banned at most ballparks for years; smokeless tobacco is next. About half of the MLB venues now prohibit tobacco of any kind, including “snuff” and “dip.” What’s more, a recent contract agreement bars new Major League players from using smokeless tobacco anywhere. Why all the fuss? Because tobacco isn’t safe to use in any form. People who use smokeless tobacco get just as much highly addictive nicotine as cigarette smokers. Plus, they get a mouthful of chemicals that are known to cause cancer. This puts them at higher risk for oral cancer, cancer of the esophagus, pancreatic cancer and other diseases. A number of renowned ballplayers like Babe Ruth, Curt Flood and Bill Tuttle died of oral cancer. The death of Hall of Famer Tony Gwinn in 2014 focused attention on tobacco use in baseball, and helped lead to the ban. Gwynn was convinced that his addiction to smokeless tobacco led to his getting oral cancer. Yet tobacco isn’t the only cause of oral cancer. In fact, the disease is becoming more common in young people who do not smoke. That’s one more reason why it’s so important for people of all ages to keep to a regular schedule of routine dental exams. These visits offer a great opportunity to detect oral cancer in its earliest, most treatable stages. So as you watch your favorite team, take a tip from the professional athletes’ playbook. If you don’t use tobacco, don’t start. If you do, now is a good time to quit. For help and support, call an expert at 1-800-QUIT-NOW or visit smokefree.gov.